Sorry... the 2016 Hyundai Equus is no longer being sold as new. 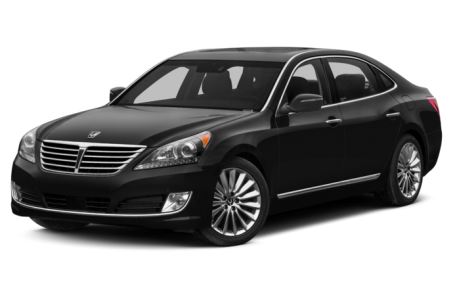 The 2016 Hyundai Equus is a legitimate full-size luxury vehicle and the crown jewel of the Korean automaker’s lineup. The Equus, which debuted in 2014, is intended to compete with the biggest, most luxurious sedans on the market including the BMW 7-Series and the Mercedes-Benz S-Class. As such it comes with a ton of standard equipment inside and out, and a price that is significantly less than its competitors. Styling is conservative and understated; the Equus is a large sedan that carries its size well and doesn’t try to look too athletic (something it is not). 19-inch alloy wheels come standard, as do power-folding heated side mirrors, automatic windshield wipers, LED fog lights, and a power moonroof. The Equus does add an available hands-free smart trunk for 2016; if you stand with the key fob on your person behind the trunk for three seconds, it will open automatically which makes it easier to load the trunk when your hands are full. There is only one engine option, a 429-hp, 5.0-liter V-8 that is mated to an eight-speed automatic transmission. The rear-wheel drive Equus also comes with a standard air suspension with adaptive dampening which gives the big sedan an incredibly composed, smooth ride even over broken pavement. Fuel economy is estimated at 15/23 mpg city/highway. Inside is where the Equus really shines, with a long list of standard comfort and technology features, as well as an abundance of room for passengers, front or rear. Standard features include premium leather upholstery, wood trim pieces, powered/heated/cooled front seats, heated rear seats, HD radio, tri-zone automatic climate control, navigation system with a 9.2-inch screen, USB port, Bluetooth connectivity, heated steering wheel, a power rear sunshade, and a HomeLink universal remote. Upgrading from the Signature to the Ultimate trim levels adds cooled rear seats, a rear-seat entertainment system with two monitors, a 12.3-inch LCD instrument panel, and a heads-up display. The 2016 Equus also offers a long list of driver aids and safety technology, in addition to the expected nine airbags, antilock brakes, and electronic stability control. Smart cruise control which can maintain a distance from the car in front of it automatically in traffic, blind spot detection, front and rear parking sensors, rear cross path detection, and a rearview camera are also standard. A multi-view camera system that includes front view cornering cameras is also available.